CN: How did you get started as a race mechanic? EC: One day, Fiorenzo Magni came into my workshop in Cambiago. He had heard of my reputation and his bike needed adjustment…since his legs hurt. I adjusted the cranks and Magni’s legs felt better so he invited me to be second mechanic for his Nivea team at the Giro d’Italia in 1955. I was only 22 years old. I had never travelled, so that was an adventure. My brother-in-law lent me a cheap suitcase for the trip. Nivea’s head team mechanic was Faliero Masi, I was second mechanic. But I was better than Masi at building wheels. I was really fast at building bikes too, faster than Masi because he had worked in a store, while I was working in a factory. That was the difference in my mentality. Plus I was born with fast hands. CN: What would you consider the most important moments in your career? EC: Look, for me, there have been so many great moments. Like during my first Giro d’Italia, Coppi gave me a jersey. I was always a tifosi of Coppi. We worked day and night but with the great experiences I didn’t get tired. I got to meet all the cycling journalists, and Mr. Zambrini from Bianchi asked me to come to work for him. Every evening after the work was done, I would take a walk to get some air. Our pay was 2,500 lire per day and at the Giro, I got to know Zambrini and Clement and Campagnolo. They wanted to get to know me and it was a great experience for me. I got to know everybody, the people who made the saddles, the gear changers. And I really wanted it. People saw that I knew what I was doing, that I had the right character for the job, that I was simpatico, that I got along well with the riders and could work hard, well that opened a lot of doors for me. Some of the big name mechanics were jealous of me, but I had a lot of support from the others too since they recognized I knew what to do. Plus since I had been a racer so I understood the sport. That was important. CN: How about your friendship with Fiorenzo Magni. How was he to work for as a young race mechanic? EC: Magni was very serious, very professional. As a rider, he had a lot of character. He knew how to suffer, since he couldn’t fight against Coppi or Bartali. His strong character was an example to others. Like when we were eating dinner at the races, he was never rude to the waiters, he would always say ‘please bring me some more bread, some rice’… you understand? Plus he was very clear and precise to work for. He would tell you just what he wanted, but with respect. CN: The character of Magni came out in the 1955 Giro, when he broke his collarbone, but didn’t abandon. EC: Maybe you saw that photo of Magni… I rigged up a way he could pull on the bars during the race by taking the latex tube out of a tubular and wrapped it around the handlebars. That way it helped take the pressure off his arm. Magni asked me to help him but he wasn’t certain about it at first, but when he tried it, Magni saw it worked. CN: What were some of the technological advances you are most proud of from the early days? EC: At first, my bikes were known for their unbreakable forks. In the old days, in order to bend the fork blades, the metal was heated up. So in 1956, I realized that if the fork blades could be bent without heating, they would be more flexible and absorb shock better because once the metal is heated up, it loses some flexibility. So I figured out a way to bend the blades fixed in a jig on a workbench with two pieces of wood. But before I got this new development right, believe me, there was a lot of hard work and I had to throw away a lot of tubes to get it down perfectly. In the late sixties, I was the first to develop microfusion (cast) fork crowns to further improve the fork. I had seen some special parts for airplanes and for shotguns made by Microfusione Italiana. Since the forks had to be extra strong for racing the pave, I decided to eliminate the stamped fork crowns and lugs and take a different direction. CN: What happened after the Nivea team finished in 1956? EC: After that, I moved to the Chlorodont team with Magni, where Gastone Nencini was the team leader. He won the Giro d’Italia. Like Magni, he was from Tuscany. He was a very generous person, a real gentleman and as a bike racer, Nencini was a real fighter. He kept going no matter what. 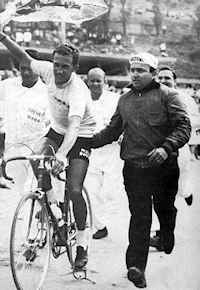 Nencini didn’t have an aerodynamic position, he was kind of twisted on his bike and pedaled with a lot of power. Because in those days, with all the racing on unpaved roads, the racers didn’t need a lot of style. Nencini was a strongman with a lot of endurance. CN: Who was Nencini’s biggest competition in those days, Ercole Baldini? EC: No, Baldini came after Nencini. Well, Nencini came up in 1955, he was in the breakaway with Magni, who won that year on the Trento-San Pellegrino stage. I was behind Magni in the team car that day. Nencini had the Maglia Rosa and the riders were on gravel road near Thiene, Nencini had a flat. 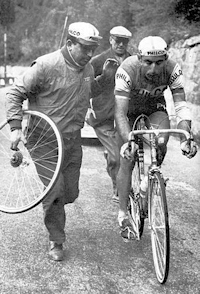 As soon as Magni saw that Nencini had a flat and had called his team car, he went to the front and started to ride extra hard. At the same time, Nencini got a slow wheel change, the mechanic was wrought by emotion and so Nencini lost 50 seconds. He chased Magni and Coppi all day, but never caught them. He lost the Giro d’Italia on that stage! But Nencini was young, only 25, and didn’t have much experience. CN: Do you have any other memories as a race mechanic in the late ‘fifties? EC: Oh, there are so many… perhaps one day that stands out was Stage 20 of the 1957 Giro to Levico Terme. Nencini had the Maglia Rosa, but on the long descent from Passo Brocon, the road was gravel. In less than 2km, Nencini had three flats. Each tire was cut to shreds. But we managed to lose less than 30 seconds for all three wheel changes! CN: What was your next team after Chlorodont? EC: I stayed with Nencini and Chlorodont another year, through 1958. I learned a lot there from the team direttore sportive Tano Belloni. We talked for many hours and he helped a young guy like me. Then I worked with Philco, with Magni as d.s. and Guido Carlesi. In the meanwhile, in 1960, I had my first big win on a Colnago bicycle. The team bikes I built all had other names on them which was the custom at the time. I gave a track bike to a local rider, Luigi Arienti, who was part of the Italian Olympic Track team. He and his teammates Vigna, Valotto and Testa won the team pursuit, which was a great joy for me to know an Olympic God medal was won on a Colnago bike. 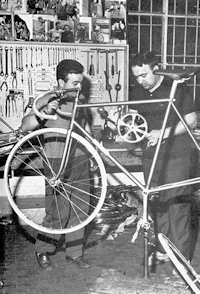 Then I went to Molteni in 1963 with Carlesi and was the team mechanic there for 11 years. My friend Giorgio Albani was direttore sportivo and it was a great time with riders like Michele Dancelli and Gianni Motta, who were good amateur riders who turned pro in 1964. Rudy Altig was at Molteni, and eventually Eddy Merckx. Molteni was a major salami maker and they really had a lot of passion for cycling there. Mr. (Piero) Molteni was like a father to me. His son Ambrogio was the same age as me and we all got along very well. CN: What about Gianni Motta? He was a great rider that is kind of forgotten these days. EC: I knew him because he raced on my bicycles when he was an amateur and I got him his first pro contract on Molteni. Last year at the presentation for my 50th Anniversary bike, Motta was there. Do you remember that he told the story about when he bought his first bicycle from me and didn’t pay for it? He didn’t have any money when he came to my officina so I agreed to let him pay for it in instalments. He paid a bit, but then stopped paying. He told me ‘I shouldn’t have to pay anymore because I’m winning races on your bicycles, so you should just give it to me’. He still owed me 14,000 lire but I decided to let him slide. He won the Italian junior championship and then the (amateur) Giro di Lombardia. In 1966, he won the Giro d’Italia for Molteni. Motta was an extraordinary rider. He had a lot of class as a rider, but was also an extrovert. Like a big kid… he wanted to win everything right away. 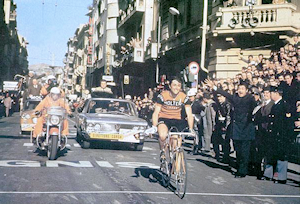 CN: And that day in 1970 when Michele Dancelli won Milano-San Remo for Molteni, the first time an Italian rider had triumphed in 16 years? EC: That was very special day as well. Dancelli was on a solo break and he had great legs, he had won the Trofeo Laigueglia just a month before. Mr. Molteni was in the team car with me and Albani. As San Remo got closer, Molteni leaned out of the car and told Dancelli ‘if you win, I’ll give you the (Molteni) factory!’. When the news came that (Eric) Leman was chasing solo behind, Mr. Molteni yelled even more at Dancelli, but the gap was steady, 2’15”. When Dancelli hit the Poggio climb, Albani said ‘he’s done it’ and he did. Mr. Molteni was so happy and he ended up giving Dancelli a big bonus for his win. That Milano-San Remo win inspired me to change the logos on my bikes. It was like I had an ace up my sleeve that day, with Dancelli winning the race on my bike. So to commemorate this great win, I changed the logo from the eagle to the ‘Asso di Fiori’ (Ace of Clubs) later that year.